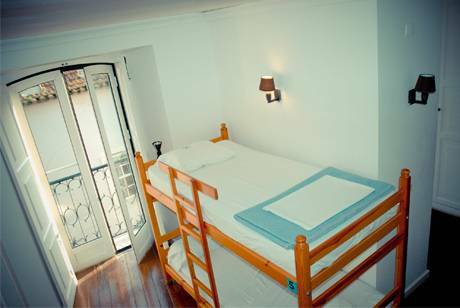 One of Europes`s best hostels, in the heart of the Lisbon`s funkiest neighborhood. A true travellers paradise! Free Welcome Drink and Weekly Parties! You're about to discover the new generation of contemporary styled backpackers. OASIS is a place designed for the modern day global traveler. Travelers who not only want refuge from the vigor of the road and good insider tips, but travelers who also want to have fun and high pressured showers, someone just like you. You´ll find our backpackers´ mansion perched on the 'Miradouro do Santa Catarina', overlooking the river and the bridge 'Ponte 25 de Abril¨. Alive with fluttering laundry, regal buildings and balcony gossip Santa Catarina is smack in the middle of Lisbon's cultural and entertainment life. The adjacent neighborhood of Chiado is perfect for an afternoon of shopping or just loitering in cafes. At night, a few steps from our front door, the famous 'Bairro Alto' comes to life. The storefronts that were shuttered before have burst open, revealing an endless array of small bars, the decoration of which seems to have been left to young art students and fashion designers. Add plastic cups and no covers and you have one of Europe's hottest and cheapest nightspots. Whether you are exploring monuments to colonial power in Belem, hiking through the historic Alfama, tracking down the melancholic sighs of Fado, making your way to Sintra or heading off to the beach for the day, our staff, well versed in the art of travel, can offer tips and advice on how best to navigate the city. We also keep you connected with free and incredibly fast ADSL internet, Wi-Fi access, Computers with memory card readers and CD/DVD burning facilites, Phone cards and available phone for keeping in contact with the family. When the museums close and the sun sets unwind with us at the bar in the patio garden, enjoy our famously yet economical home cooked dinners everynight, grill some meat (or veggies) on our Bar-B-Que, or just take our elevator up and down all night. If you just want to stay in and take a break from traveling, we can help with high pressured showers, 9 inches of mattress heaven, clean dorms, Gourmet cooking facilities, Portuguese classes, high-brow library, laundry service (we even fold your clothes) and cult cocktail hour where you can trade travel tales over Singapore Slings and some tunes. If it`s surf you\'re after. We have agreements with the best surf schools in the country where you can rent a board and surf with the pros all day long! Free Night tours with our Bairro Alto expert who\'ll take you to the best bars in town! Every night except Monday and Friday. Take a day trip with our X-van from the beach and palace in Sintra to the best homemade italian ice creams in Cascais. Welcome to state of the art facilities, superior comfort, clean bathrooms and a staff well versed in the art of backpacking. 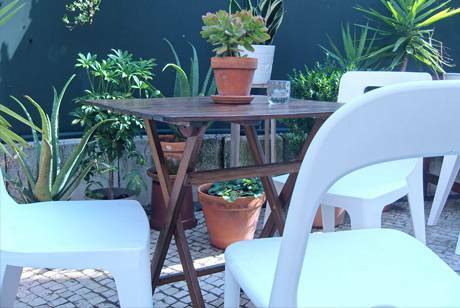 Welcome to Oasis Backpackers´ Mansion Lisboa! 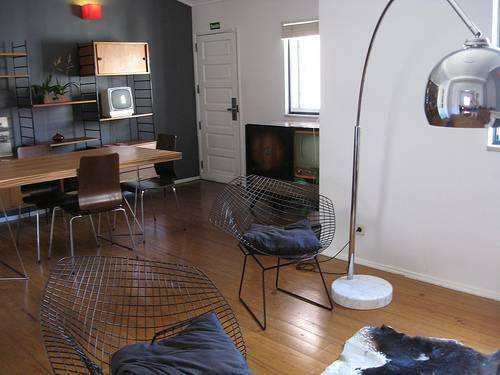 WHAT\'S FREE: Breakfast, 24 hour ADSL Internet access, Welcome Drink, CD/DVD burning, Coffee & Tea, Wi-Fi connection, travel tips, night tours, insiders travel guide to Lisboa, sheets, library, loads of ambience and general good cheer. Cancellation needs to be made 24hs prior to midday on day of arrival by email. When you arrive, head upstairs where there are two exits. Leave through the one marked Largo do Chiado. You will see a building marked Fidelidade Mundial. From there look right and you will see a huge plaza with a statue in the middle, Praça Luis de Camões. In plaza look for a pharmacy called Sanitas or the Diesel Store, and follow a street named Rua do Loreto, where the tram lines go. Follow that up. You will know you are heading in the right direction if you see a store with a yellow taxi cab sticking out. Continue on Rua do Loreto and turn on the 4th street to your left, Rua Marechal Saldanha, also marked by a sign for the Museu de Farmácia. Follow Rua Marechal Saldanha until you arrive at the Miradouro de Santa Catarina, a viewpoint. Look to the right and at the bottom of the hill you will see the big yellow house with the Palm tree. That is your Oasis, Rua de Santa Catarina, 24. The main entrance is on the left side of the building. Head out of the airport, in front of the main entrance you will see a bus stop marked by a yellow sign. There you can catch bus 745 direction Santa Apolónia (runs 7-24hs). There is another bus called the Aerobus, which is more expensive and follows the same route - don't take it. After about 20 mins, get off the bus at Restauradores. (Huge pink granite Art Deco building that says Eden Teatro). From that stop, head towards Hotel Avenida Palace. On the corner you will find Rua 1o de Dezembro. Follow that street until it ends then on your left, you see Rua do Carmo. Follow that street up until you reach Rua Garret. (Large shopping mall on your left called Armazens do Chiado). 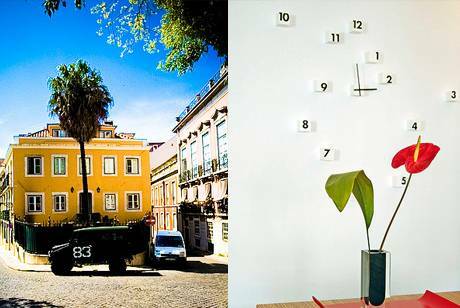 Take Rua Garret to the right and follow it until you reach Praça Luis de Camões. There you find the Metro of Baixa Chiado and you can follow the directions above. If you decide to take a taxi the price is around 10€.